Ralph Craig and his 16" f/5 Dob at the 2010 Orange Blossom Special (OBS) Star Party on 2-10-2010. This was first light for this telescope, which was completed about a day before the star party began. Allen Maroney and his 18" f/4.89 dob during first light on 2-6-2010. His 16 inch better than 1/4 wave f/4.76 mirror was finished on 4/20/2013, which also happens to be his birthday. Congratulations and happy birthday Paul! This shows the light weight 12.5 inch mirror batter. Mike cast the mirror and has been perfecting the honey comb pattern. holds his newly finished 1/8th wave, 10" f/5 mirror on 11/14/2009. The Fixure XP display in the background is from his mirror's last test. with his infamous "Pringles" 20 inch thin mirror scope. 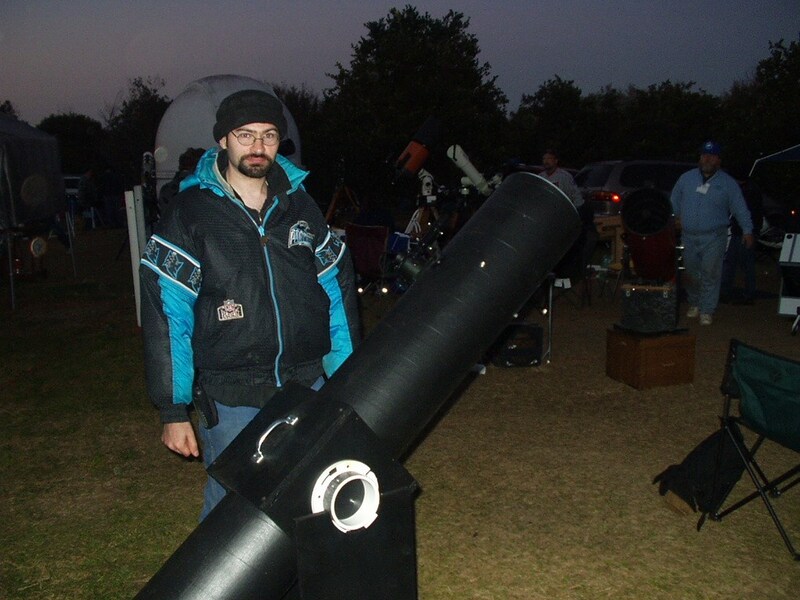 first light of the Black Knight at the 2003 OBS star party. Featuring a 1/4 wave 8 inch mirror ground at the lab.